Misfortune and random happenstance have a way of turning back the clock. Plans, carefully laid or thrown together at the last minute, stand equal chance of unraveling -- leaving you nowhere to go but backwards. In the end, we all must answer to capricious fate, and the proper response is always "Yes, ma'am." In the early 1990s, Portland art-rock stalwarts Tao Jones could often be found laying down complex grooves for a loyal cadre of fans, playing along with the likes of Caveman Shoestore, Big Daddy Meat Straw, Hitting Birth and others. Guitarist Dylan Vance would pivot at the waist like a poorly designed bobble-head toy, fluidly tapping out jazz-flavored fretboard antics to the delight of all. After spending time in Sweet Honey Dijon Jazz Quartet and Groove Revelation, Vance went solo. Or so it would seem. I eagerly awaited his June 14 solo acoustic turn at Mt. Tabor Theater and Pub. Perhaps I was the only one, as he failed to appear for the show. But Mt Tabor had other delights to offer, of which I found myself forced to partake. Johnny Outhouse, an Erie, Pa., drum and acoustic guitar duo, played an intriguing set of dusty, monochromatic country rock. The guitarist/singer whipped up a dust storm on the heavy choruses with some impassioned strumming, but on the whole, the flavors weren't varied enough for my taste. Up next were the jam-band prog-rock efforts of Switch. The band's angular, modal (or atonal) tunes showed promise, even to my ears, which are not fond of this particular brand of jamming. In this case, Switch betrayed a 'Maha-Phish-nu Orchestra' leaning. Though the bassist needed to exercise some serious restraint (instead of constantly running up and down the fretboard), Switch occasionally landed a nice, cohesive groove. Then the assault began -- a 20-minute-plus opus, which contained not one, but two drum solos. Only one (if any) drum solo per song, please, no matter how long the tune. During this epic, the band members appeared out of sync, frequently shooting angry-looking glances at each other, as if they had plans for the meandering jam that consistently went awry. Regardless, the dearth of musical ideas contained in this apparent improv made it an endurance test. By sticking to structured tunes -- and holding back a bit -- Switch may yet please its fans. As for me, I'll take the evil, caustic funk of early-'70s Miles Davis whenever I need to hear a half-hour of freestyle music. These thoughts are my extremely roundabout way of getting to Trance Territory, a dance performance by the Wally Cardona Quartet, with DJ duties handled by New York's DJ $mall Change. The May 25 performance at the Portland Center for the Performing Arts was a masterpiece. Trance Territory combines the rave/trance scene with Haitian voodoo rituals. Or rather, it makes explicit the connections between rave culture and spiritual dances practiced the world over. It's a small but fundamental leap in judgement -- and about time someone made it. DJ $mall Change spun records for the hour-long performance, starting out with heavily filtered, muffled tracks that highlighted the clicks and pops of his vinyl as a principal rhythmic component. The effect was subtle and insidious, creating an atmosphere wherein the audience was tricked into appreciating the loftier qualities of a musical genre many consider repetitive and banal. After 30 minutes, the filters came off and the full, pulsing, crisp and thunderous power of $mall Change's selections became apparent. Those in attendance came to understand the power of trance and dance. Cardona's choreography was stunning, and the spare look of the performance simply brilliant. A lone light bulb hung from the side of the stage for most of the performance, before the rear curtain was lifted to reveal the monolithic stage door behind. Near the end of the performance, the dancers (Cardona, Johanna Kotze, Kathryn Sanders and Matthew Winheld) began pulling long strips of duct tape from the floor, revealing a fluorescent red grid. These elegant touches cast in stark relief the beautiful, programmatic dances, which functioned like the music itself, as gorgeous repetitive riffs with hidden cosmic meanings. 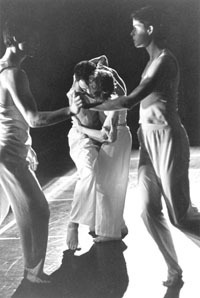 Cardona even managed to mess with the notion of time and space itself during the second dance motif of the performance. Sanders, at the front of the stage, rose from the floor in extreme slow motion, while the dancer in line with her at the rear of the stage did a frantic Fine Young Cannibals routine. The combination, implying that things seen in perspective have a chronological as well as spatial relationship, blurred the boundaries of our perceptions in the fashion striven for by ritualistic dances. Cardona's 2001 tour with Trance Territory, sadly, is done. But Portlanders who know what's good for them should start applying pressure on PICA (Portland Institute for Contemporary Art) to bring the quartet back as soon as possible. Sometimes, when plans fail, they do so in order to remind us of what we truly value in life, such as the power of music and dance. Wally Cardona's Trance Territory planted a lump in my throat with its unremitting beauty and purpose. E-mail Kurt at orangeandorange@msn.com, and don't miss his previous reports.